Finding ways to work efficiently with visiting students has been a process for the Department of Civil, Environmental and Architectural Engineering (CEAE). The department’s goal is to “make their experience here the best they can have,” said Associate Professor Mario Medina. Visiting students sponsored by the Brazilian Science Mobil- ity Program have been coming to KU since fall 2012 for one semester or an academic year. Twenty-six have taken CEAE classes. The fix that Medina developed is procedural, but for students new to the university, it is a big help. Because visiting students are not degree seeking, they need permis- sion numbers to enroll. This required someone to contact faculty members to get the information, which could be frustrating. To save the department staff and the students’ time and effort, Medina designed a form for students to fill out listing the courses they want to take. Medina then veri- fies if the student has the pre-requisites to take the course, gathers the permission numbers and shares them with the students and department staff. Students can enroll quickly, changing the process that used to take 10-20 days. Medina has four BSMP students in his Architectural Engi- neering course Energy Management. “They are excellent students and have enriched our classes,” he said. To attract international students, it helps to have international faculty members who understand cultural differences. This extends to the other international students from Egypt and Iraq who take CEAE classes. Administrative Associate Susan Scott works to match Iraqi graduate students with the right professor and is available to help with problems and to connect them with other students. BSMP students are required to get an internship or do summer research. 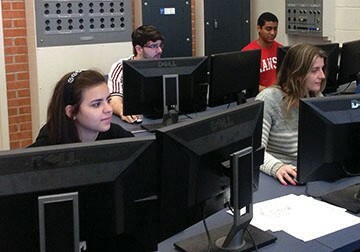 BSMP Students contacted KU faculty about com- ing to KU, and this summer seven students attending other universities will spend eight weeks working with KU faculty. “The relationships the Visiting Student Program, and BSMP in particular, has with academic departments is very important. CEAE is one of the incredibly supportive departments that not only permits visit- ing students to enroll in their classes, but offers research opportunities and faculty support to the students as well. Without the assistance from departments like CEAE, these programs couldn’t exist at KU. We really value the academic departments at KU and hope that what these students bring in terms of perspective and culture is a benefit to the departments,” said Celeste Yaluk, sponsored and visiting student coordinator. -Article has been excerpted from HORIZONS.